You know, this Saudi Prince seems to be making some inroads... maybe the President wants to give him a little time..... Wasn't it a Black Democrat that wondered if we couldn't all get along? Well, Trump maybe thinks its a possibility..
Why are they not now? Do you not agree that past history shows they are the most dangerous country when it comes to radical Islam? What has the UN done to stop Saudi Wahhabi sponsored terrorism? What did Obama and HRC do to stop it? WTF are you talking about? The question is why is SA not part of the travel ban? That country is infested with a brand of Islam that has killed thousands of Americans. But hey, keep tap dancing. Are you saying all Muslims who practice Wahhabism are terrorists? What percentage of those practicing Wahhabism worldwide make up these groups? I don’t disagree that the majority of terrorist organizations practice a very radical form of Wahhabism, but they’re in the minority compared to the overall population who do practice it. The KSA have taken steps over the last few years to purge these folks from their ranks. They also have missionaries all over the world teaching a much more peaceful form of Wahhabism. Was the Saudi government involved in 911? Many say they were genuinely shocked by that act of terror and the fallout that followed soon after. If the Saudi government was involved in 911, why did we never go after them? It’s been almost 17 years since it happened, yet 3 presidents and the UN have yet to call the Saudi government to the carpet for it. Should we go after the auto manufacturers or the liquor stores for the drunk drivers who kill innocent people? I’m all for putting SA on the ban list if we can prove they were involved in 911. Again, Wahabbism is responsible for the deaths of thousands of Americans. It's roots are deeply seeded from Saudi Arabia. Despite the Saudi Monarchy (who talk out both sides of their mouths), there is a significant portion of the Saudi population who follows this extreme form of Islam. So if we are protecting Americans, why is SA not on the list? Significant portion? What percentage of those practicing Saudi Wahhabism are terrorists? Now who’s tap dancing? Sorry bud. Your attempts at deflection and other BS ain't gonna work. Your attempt to defend the omission of KSA from the travel ban is beyond laughable. This is the fatherland of the brand of Islam which has brought us 9/11, Bin Laden, Isis, Al Qaeda, etc. It's not even close. This travel ban is a joke and there is no reasonable explanation as to why KSA isn't on it. We have spent the last 20 years fighting Wahhabists/Salafits at the cost of trillions of dollars and thousands of lives lost. But then again, pragmatism and rational discussion isn't needed for Trumpism. Ok, so why isn’t SA on the travel ban list? I asked the question, it's up to you Trumpkins to explain to us the "sanity" of a travel ban that doesn't include KSA if the goal is security for American citizens. So far, you've failed, as expected. How is it liberal BS to ask why SA is not included in the travel ban of a president who preaches "America First"? You're the one who chose to jump in. I've asked a very legitimate question and all you've done is tap dance around the question for 2 pages and deflect. The truth is, you know it's BS that SA isn't in the ban and you know it's a really bad look. Did Saudi Arabia purposely send the 15 hijackers over here to carry out 9/11? Now you’re talking in circles as I’ve already asked that question. Did they? I've burned your @ss on this one and you're flailing wildly. Did the Saudi government purposely send the 9/11 hijackers to this country? If they did, then they most certainly belong on the travel ban list. If they did not, then the travel ban is crap because they came over here anyway and killed over 2000 American citizens. Remember, this is suppose to be an "America First" administration. LOL. look at you. 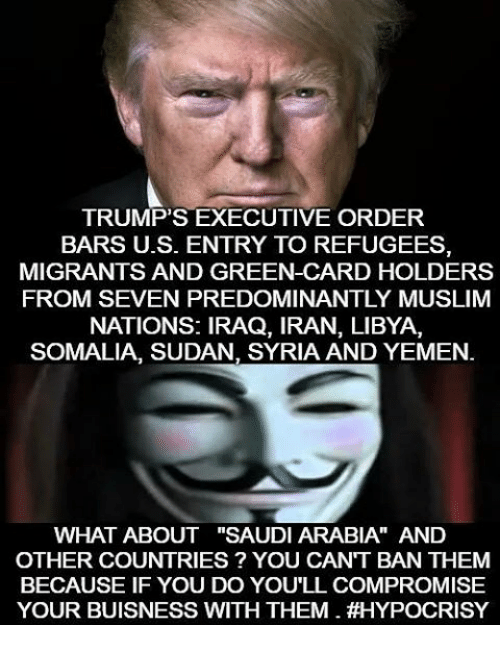 You are honestly trying to defend the omission of Saudi Arabia from the travel ban. You know damn well that country is as dangerous to Americans as any other Muslim country. If you doubt me, I would suggest to take a trip to ground zero like I have many times. There are over 2000 dead American's that agree with me. I never said whether they sent them or not. If you can read, what I said is it doesn't matter, they got here anyway and they killed over 2000 Americans. So if you're going to have a travel ban, they need to be at the top of the list. Keep tap dancing. I’ve answered your questions, but you won’t answer mine. You reply with another question. Who’s tap dancing? First of all, you have not explained why SA is not worthy of being at the top of the list for a travel ban. You've been tap dancing for 2 pages now. Second, WTF is your question? I’m confused by your reasoning here. Is Trump banning travel from these countries because of possible terrorism, or because they’re Muslim? My reasoning is that I'm confused by Trump's reasoning. He campaigned on a Muslim ban because of terrorism. His "travel ban" now includes countries which do not have a history of domestic terrorism. However, the country who harbors the most intolerant and dangerous form of Islam is not on the list. This country also has a history of domestic terrorism in this country. 911 was almost 17 years ago, and I’m pretty sure SA has stepped up their game against terrorism since then. You wanna go back in time, let’s talk Peart Harbor-why isn’t Japan on that list? ISIS, Al Qaeda, Boka Haram was 17 years ago? Has SA extinguishished the Wahabbist ideology that they have harbored? Your gonna have to provide a link. There are 4 million Wahhabis in SA and many more across the Middle East and beyond. Extinguish an ideology? Don't you think that alone should put SA at the top of the list if you want a travel ban to "protect" Americans? Maybe it will be in the near future, now that the court has opened the way... or maybe the President has another pressure point that would work better.... I don't know and neither do you, but what the President did with NK so far is aces.... whether you like it or not... Trump said the other day, "Its important that nations get along." Makes sense to me... Doesn't it strike you odd that President Trump can work a deal with North Korea but the democrats will fight him tooth and nail regardless of what he does? I would point out Trump following a law Bill Clinton and "W" had their finger prints all over... Are you big enough to admit that? Tell me again about what Trump has accomplished with North Korea. Pictures again... I hate dealing with a 12 year old... Trump is doing magnificently !! !